Missed the “Lean Methods” webcast? Take an hour to view the recording and reflect on the value of continuous improvement in RIM. 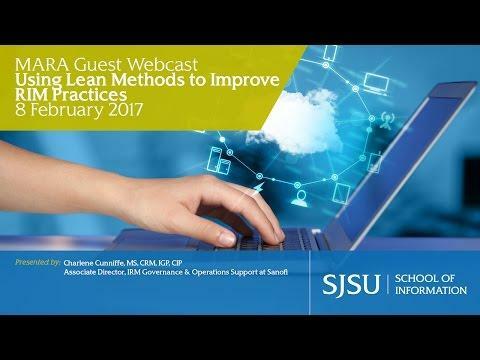 The “Using Lean Methods to Improve RIM Practices” webcast presentation, given on February 8, 2017, by Charlene Cunniffe, is now available on the iSchool’s YouTube channel. Cunniffe, associate director of governance & operational support in information and records management at Sanofi, a global pharmaceutical, vaccines, and biotech company, presented on using lean methods to improve business practices, with a focus on continuous improvement. Cuniffe provided a history and definition of the Lean/Kaizen model for process improvement, discussed value vs. waste, and shared methods for process improvement. I thoroughly enjoyed the live presentation and found that it supported many topics explored in MARA courses, particularly MARA 204 Management of Records and Archival Institutions and MARA 284 Information Governance. It is critical that records professionals have the ability to articulate and demonstrate the value-add of efficient RIM processes, as well as the toolkit necessary to measure, analyze, improve, and control the programs we manage. I highly recommend taking an hour to view this presentation and reflect on the value of continuous improvement in RIM.